I have been thinking about "non-attachment" and the "I don't care" philosophy for some time. Last October, I was discussing Buddha and Jesus on the topic, and my recent researches reveal that there are lots of people who advocate this "I don't care" approach as a way to minimize the pain of existence on a personal level. It's not just Judy Garland. Click on the image of the button to get connected to one such discussion. 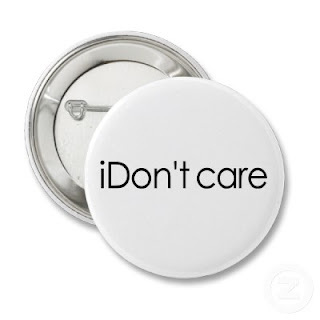 What got me thinking about the "I don't care" issue most recently wasn't so much the application of that approach at the personal level, but the problem it poses at the political level of our existence. The Our Breathing Planet website was bemoaning the fact that "everyone likes to say they do the right thing but very few actually do it." I postulated that the reason was pretty simple: those who aren't doing the "right thing" really just don't care. I was only partly being facetious. Importing an "I don't care" and "non-attachment" approach from the personal to the political level is an obvious explanation of why we are not dealing more effectively with what are now recognized as life-threatening challenges to our continued existence. On the personal level, "non-attachment" and "I don't care" may indeed reduce personal pain. On the larger, political level ignoring our collective problems can (and undoubtedly will) lead to disaster. I am thinking specifically of global warming, but there are lots of other examples, too. If you are interested in global warming, you might like to read a recent paper entitled, "How Not To Save The Planet."